Why does everyone seem to find it amusing when I say that I’m currently working on the history of shaving? This has happened a few times now. Even at academic conferences when it’s not very polite to snigger at other people’s research, I’ve heard that snorty-pig laugh that people do when they’re trying to stop themselves. A lesser man would be offended. Shaivng though, is actually a window into a hidden world of eighteenth-century politeness and masculinity and one, for the most part, historians have ignored. Let’s settle one thing straight away. When I say shaving, I’m talking about men’s faces. Why? There are several reasons why I think this is a fantastic topic. First, this was a period of history that witnessed the development of a whole new market for shaving paraphernalia in the eighteenth century – one of the first markets aimed solely at men. Second, something happened culturally to make beards facial hair deeply unfashionable. The eighteenth century has been described as the first truly beardless age in history, and the reasons why are unclear. It might have to do with anything from health to ideals of the classical body. Whatever the reasons, it is rare to find eighteenth-century portraits of bearded men, but beards were often used as a visual shorthand in satirical cartoons to suggest a dirty, unkempt or even socially inept men. Thirdly, the invention of cast steel made a whole new range of lethally sharp, but beautifully polished, razors available. Accompanying these, in newspaper advertisements, were a range of other products for male pampering, from face creams to powders and scents. Also, this period witnessed a transition from one where men visited barbers to be shaved, to one where they began to shave themselves. For the upper classes shaving yourself meant getting your servant to do it for you, but it amounted to the same thing. So, sniggerers, this is actually serious topic of research, with many fascinating avenues to explore. But, in all seriousness, it highlights how even the most apparently mundane of daily tasks can often harbour a range of hidden meanings. It is often worth looking at the minutiae to see the bigger picture. And here endeth today’s lesson. At a recent (sadly unsuccessful) job interview I attended, an interesting question was put to me about the rapid digitization of archival manuscripts. Given the technologies now available, it was suggested, why do we still need to spend precious money in storing a lot of rotting old papers? We now live in an age of massive expansion in terms of the types, volumes and quality of archival documents online. I often wonder how my forebears managed to submit MA and PhD theses in manually typed form, knowing the arduous process that even editing in electronic format can involve. But the genie is now very definitely out of the bottle and it is completely conceivable nowadays to write an entire article, if not even a book, based on primary source material, without ever once having to leave the comfort of your own home. If we think in terms of even the last twenty years, then this is a massive step. As an example, I’ve just finished and submitted an article on the history of shaving in the eighteenth century, and its role in relation to politeness and masculinity. Were I to have attempted this in, say, 1992, lengthy trips to the British Museum would have been involved, as would days spent manually trawling through their newspaper archive. Now, I can not only see the pages of the papers to a level of high detail, but can search their contents by keyword. The database software, while not always perfect, has pretty much done the job better than I could have, and in a fraction of the time, and minus the travel costs. But does all this digitized content have qualitative implications for the ways that historians conduct their research. I think this is an interesting question. In many ways I’m a traditionalist in terms of actually seeing the original documents. There is something (sad as I am) about the sight, touch and even smell of seventeenth-century documents that is familiar and reassuring. But, more seriously, there are certainly methodological implications raised by digital documents. Even simple things like the size of a manuscript can be important, as can its size and even feel, that a digital document cannot replicate. Thinking about a recent article I wrote on recipe collections, I was able to identify the origins of the paper used in a particular Welsh document through the watermark on its paper; no digitized document – at least as far as I know – currently allows for this level of detail, but without it, this important point would have been missed. The serious point is this. Digitizing is fantastic in terms of widening access to documents for everyone, and certainly not just academics. It allows people who might never have visited – or ever intend to visit – a record office, and in many ways is better for the survival of these often rare and fragile things. But even the basic examples I’ve mentioned here should alert us to the dangers of abandoning MSS althogether. While technology is a tool, a useful adjunct and undoubtedly a friend to the researcher, I think there is still a strong need to study documents in the form they were originally created in, to fully grasp and understand them. I mentioned in my last post about some of the documents I’ve bought (and then felt guilty about!). By means of divesting my conscience, I’m going to put an example here to demonstrate why I think these things can be well worth the money. Withey MS1 (!) is a doctor’s bill for services rendered to Sir Christopher Musgrave, (1688-1736), the 5th Baronet of Edenhall in Cumbria in 1733. From what I can gather, Musgrave was a “hot-headed fellow” and, fond of a tipple. The bill is signed William Donkin and this is likely to be a surgeon of that name who lived in Penrith in Cumbria and who, from the limited information I’ve been able to garner so far, appears to have been a fairly well-to-do figure in the area. I love these types of documents. I’ve done lots of work recently on early modern Welsh recipe collections. They are great sources and give you insight into the types of remedies in use, their ingredients, where they were obtained from and so on, but they don’t give you the actual process. This does. It gives you a window into the consultation itself, the actual times a doctor visited a family, what he prescribed and, importantly, how much he charged. It’s a great way of seeing the relationship between a physician employed within a particular family, and his patient(s). The first entry, for example, refers to ‘bleeding Lady Musgrave’, which was done again three days later. This could have been a response to a specific ailment, or just a ‘spring clean’ to keep the humours moving. But the next couple of entries speak darkly of something afflicting Sir Christopher, as Donkin was called out twice to his bedside at night, for which he charged a call-out fee plus various prescriptions, from an ‘apozem’ to a ‘cordial julep’. An ‘apozem’ was an infusion – essentially a type of herbal tea, whilst a ‘cordial julep’ was another type of herbal concoction with a variety of uses. It is very difficult to infer what Sir Christopher had, but if these were the only prescriptions, it suggests something fairly mild. Other entries refer to recipes for other members of the family, including a ‘purging potion’ for the chamber maid, a ‘vomit and a draught’. Clearly, Donkin was kept busy by the machinations of the Musgrave family’s intestines! It does show what can be learned from just one document though. Context is everything, and it is always difficult to look at something in isolation. 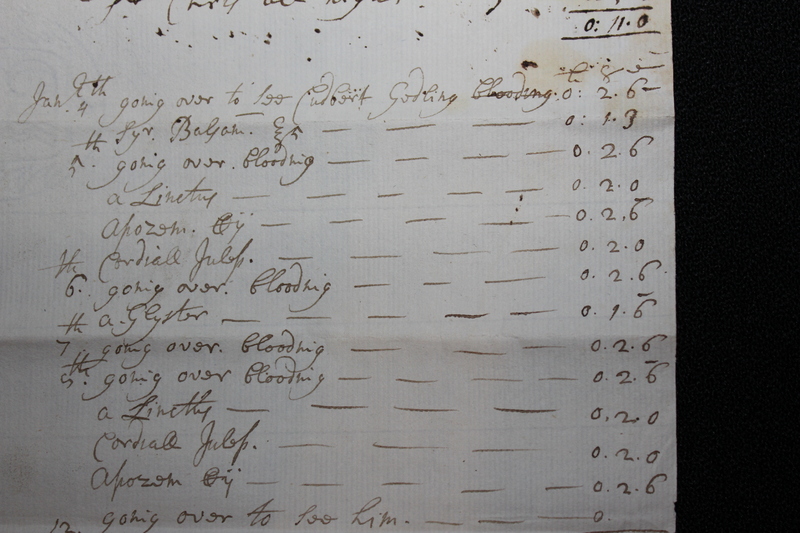 Nevertheless, even this one bill from Dr Donkin, now nearly 300 years old, reveals a very great deal about some uncomfortable moments in the life of one of England’s eighteenth-century peers! The Withey archive of early modern documents is growing. So far, I’ve collected a few bits and pieces, usually from dealers on Ebay and, frankly, at ridiculously low prices. For a few pounds I’ve picked up everything from seventeenth-century newspapers to early modern doctors’ receipts. Star of the show is a beautiful eighteenth-century Welsh notebook which I paid a little bit more for, but couldn’t pass by. All were legitimately for sale by professional dealers, probably originally bought at some auction or other of old documents. In terms of provenance, there isn’t much, but my experience tells me that they look and ‘feel’ right. If anyone was going to buy them, why not an historian with an interest in (and love for) the time period and topics they represent? Whilst in my charge they are carefully stored and looked after, and they give me the opportunity to study them at my leisure without the usual constraints of the searchroom. But somehow it still doesn’t feel entirely right. There is a real tension between the desire to own something tangible from the period you study, and the knowledge that you are only its custodian. To me, there is something about the ‘black market’ about it; surely these things belong in a repository or a library? I’ve spoken to other colleages about this, and opinion varies. For some, like me, there is the sense that the documents were going to be bought anyway, so it might as well be to someone who will respect and care for them. Others take a dimmer view, and suggest that the correct thing would be to pass them on to the relevant record office. But record offices are often full to brimming. What would happen to my documents if I donated them? They would be stored properly – maybe better than I can – but would they be used? Wouldn’t they just join the morass and seldom see the light of day again? For the moment they stay with me and I’ll continue to try and unlock their secrets which, in the case of the notebook, is no mean feat given that it jumps between Welsh and English at random, and is largely anonymous. As more and more things come up for sale, I keep telling myself (and Mrs W.) that enough is enough and I won’t get any more. Only time will tell if this is a resolution that lasts. Not long ago I wrote a piece for the ‘Western Mail’ in a series about heroes and villains. We were asked to name our villain (mine was disease) but also nominate a hero. Mine was a fairly anonymous guy from 18th-century Bath called ‘Mr Ribright’. He owned a little electrical shop and, to deter a nuisance caller, electrified the door-knocker of his shop. A victory for the little man, which resonates with my own uncontrollable hatred of the ‘excuse me, we’re in the area…’ brigade who constantly seem to haunt my street and my house. Rant over. But, putting together a lecture for my level 2 undergrads this week on popular politics in the early modern period, I think I may have found a new hero – another unlikely character but, in his own way, one who also kicked against the system. The story begins in 1607 in the Midlands. Annoyed at the enclosure of common lands in the area, a growing number of people begin to organise themselves into a protest group. At their head is an unlikely leader – a tinker called John Reynolds. Reynolds has a USP – a small leather pouch. In it, he tells the protesters, is something secret and so powerful that it will keep the protesters from all harm. Reynolds changes at this point from mild-mannered tinker to early-modern superhero with a name to match; ‘Captain Pouch’. Insisting that he had authority from the King and God to support their cause, Pouch and his protesters descended on various towns and villages aroud Leicestershire and Warwickshire. Ultimately the protests were suppressed and Captain Pouch was captured. It is at this point that, for me, his legend is secured. No doubt burning with curiosity to establish exactly what is the magical element of Captain Pouch’s pouch, the authorities open it. Inside is…a piece of cheese! The problem with early modern remedies! Being an historian of early modern medicine is sometimes difficult. It can be a juggling act between maintaining academic credibility on the one hand, and engaging a popular audience on the other. Medicine in fact translates very well into a popular topic. Everyone knows how it feels to be ill; it doesn’t require any great theoretical leap of understanding to empathise with our ancestors as they struggled with any number of more or less serious ailments. People are genuinely fascinated – and indeed often revolted – by the types of medicines used in Tudor and Stuart times. Nothing beats the reactions of a group of primary school children when they hear for the first time that people used hen’s dung, snail-water or earthworms as a cure for sore eyes or that oil made from 20 swallows was believed to cure withered limbs. The ‘eeeurgh’ moment is palpable! And yet I also wrestle with the need to satisfy an academic audience for whom the experience (and any perception of ‘weirdness’) are secondary to the broader questions about medical culture that they can answer. There is a constant tension between what I argue in my academic work, and what I am often asked to talk about in public lectures and invited talks. Let’s give an example. In much of my work about Wales I complain about the predominance of attention paid towards Welsh folklore and magic. It’s not that these things are unimportant or irrelevant, it’s just that so much work has concentrated upon them that it obscures what I think is the bigger picture. For me, Wales was part of a bigger medical world; it was open for business and its people had access to medical information from the printed word as well as the incanted charm. Likewise, while cunning folk and dewiniaid (wizards) were absolutely important in terms of local provision, they were also part of a much broader spectrum of healers, including ‘orthodox’ or licensed practitioners and other specialists from occulists to bonesetters…even blacksmiths would draw a tooth. For me, the magical charms and ‘folkloric’ (I hate that word!) remedies were not necessarily distinctly Welsh, nor even distinctly magical. They too were a component of the wider ‘knowledge bank’ of early modern medicine. But, when speaking to a public audience, I am often gently forced down the ‘weird remedies’ route; it’s what people want to hear. At a stroke I am reduced to becoming the very thing that I complain about in my book and several articles. I have indeed even had comments from academic colleagues to this effect. But should there really be a tension? Despite many years research on recipe collections, I am still fascinated by them and enjoy the more outlandish examples as much as anyone. The question is one of degree. With more newspaper articles in train I am also thinking about my next academic research theme, and considering the implications. My ideas are based around some research I’ve done on the history of shaving in the eighteenth century, and its relation to masculinity. An article on razors and shaving; surely there’s no scope for popular interest there? Damn, I’ve done it again! I said I wouldn’t do it. I said I wasn’t interested in blogging; didn’t see the point. It started off very slowly. First it was Facebook, then I got an Academia.edu page – FB for academics. Fine, I kidded myself, fully justifiable for an early-career historian. I convinced myself that I’d never start tweeting – why would anyone want to do that. But not long ago, egged on by a certain academic colleague who shall remain nameless (for the moment), I became a ‘Twitterstorian’. This stuff takes over. I was overjoyed when I got to 50 followers, and delighted to make 100. Then the numbers kept on rising and by the time I got to 500 I had reached a state of virtual sublimity. This stuff is addictive; it makes you feel instantly popular. There is no Twitter equivalent of being the last kid in the school line to be picked for the soccer team.